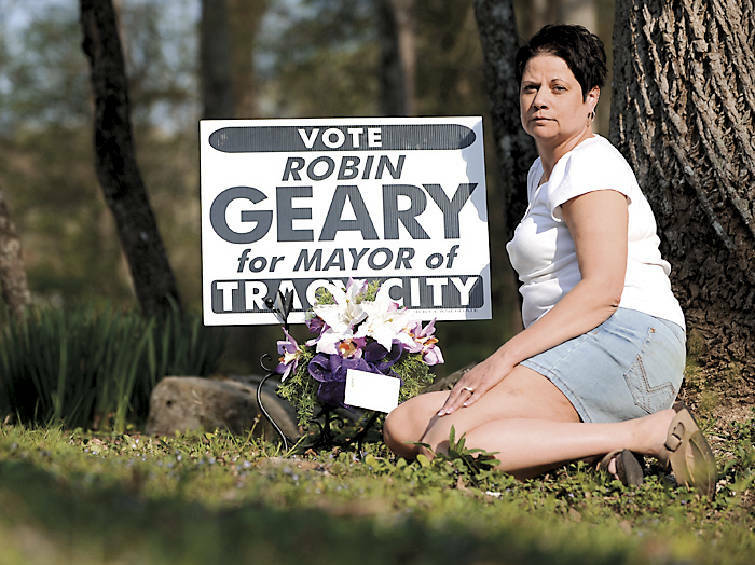 Staff photo by Allison Kwesell/Chattanooga Times Free Press - Susan Geary sits next to a sign for her husband, Robin Geary, who was elected Mayor of Tracy City, Tenn., Tuesday. Mr. Geary died March 10, 2010. Dead men tell no tales, but apparently they can still get votes. Carl Robin Geary Sr. died of a heart attack on March 10 but that didn't stop voters from electing him mayor of Tracy City. On Tuesday, the late Mr. Geary defeated incumbent Barbara Brock 268 votes to 85, according to Grundy County Administrator of Elections Donna Basham. "I knew he was deceased. I know that sounds stupid, but we wanted someone other than her," said Chris Rogers, owner of the town's Lunch Box restaurant. "If he were to run again next week I'd vote for him again." His widow, Susan Geary, said his election "was not a surprise at all to me." "The day he passed away, people were calling with condolences and saying, 'We're still voting for him,'" she said. Mr. Geary, an alderman in Tracy City since 2006 and known for always wearing overalls, campaigned on straight talk, according to supporters. At his funeral exactly one month before the election, someone propped up one of his campaign signs among the floral arrangements. "That's where he would have wanted it," Mrs. Geary said. "He really wanted to be mayor." Ms. Basham said the seat would be declared vacant and the city's four aldermen would select a new mayor. Staff members at the Tennessee Secretary of State's Office said Wednesday they've never heard of a dead person winning an election. Mr. Rogers said the late mayor-elect was a good customer and businessman who served the city well. He said the outgoing mayor was often tough to deal with. Mrs. Brock was appointed mayor in December 2008 after the elected mayor Mike Price died of a heart attack. "The headline should say 'Mayor that filled the shoes of a dead man, beaten by a dead man,'" Mr. Rogers said. Mrs. Brock, a member of the Garden Club, campaigned for mayor on her efforts to beautify Tracy City. In the end, she was shocked that voters sided with the candidate more likely to push up daisies than plant them. She is convinced many of the voters were "good old boys" who didn't like the changes she had made in the town. "Tell me something -- why would people vote for a dead man?" asked Mrs. Brock. "That was the only way they could get my job." "I'll live," she said. "I'm a survivor."